Warboys, Cambridgeshire: Roger Gaskell unpag. 130 items. Illustrated. Bumping to corners, a light 3-inch crease extending in 4 pages from front wrap, otherwise fine. Introductory essay; 130 items described with impeccable bibliographic bravura, with generous notes; Bibliographical References; Geographical Index of Printers. Dr. Edwin Clarke (1919 - 1996) was a medical historian and director of the Wellcome Institute. ''In order to sell their politics and their wares, English medical publishers addressed these doctors, as well as surgeons, apothecaries and midwives who had served apprenticeships but were not university trained; empirics who it was suggested might want to gain a solid foundation for what they only knew by experience; and women of all classes, responsible for the health of their own households, and, in grander houses, the sick poor of the neighbourhood. It was these practitioners and private individuals, above all women, who provided everyday healthcare to the great majority of the population. Womens roles are recognised in such titles as The Charitable Physitian (no. 53) and The Family Physician (no. 57) and in books which combine medical receipts with culinary recipes (no. 74). Pechey omitted from his herbal plants that every Woman knows, or keeps in her Garden (no. 89), and as late as 1790 Pultney could write that Culpepers Herbal, first published in 1652, continued for more than a century, to be the manual of good ladies in the country. Like popular medical texts today, these books were read by women to form a preliminary diagnosis, to decide if the services of a professional were called for, and in order to follow the directions of the physician for themselves and their families. The publisher Peter Cole claimed that publishing in English did not hurt the Latinate physicians interests; on the contrary by aiding the cure in this way the physicians reputation was enhanced (Riviere, Practice of Physick, 1655, A1r).'' - from the introduction.. Illustrated Wraps. Very Good. 8vo - over 7¾" - 9¾" tall; square. New York: Christie's, 1999. 93 pp + ads. 183 lots. P.O. has made short notes about condition on a few lots. 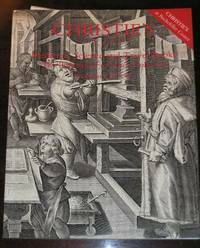 Wraps nicely illustrated with a plate from Jan van der Straet's Nova Reperta showing a 16th-century printing establishment, the front wraps showing a dramatic view of the press, the back compositors, proofreaders and collators. The frontispiece shows the TP of Thomas Geminus's Compendiosa totius anatomiae dlineatio, aere exarata, 1545. Other notable illustrations include the first engraved view of Niagara Falls as it appeared in Louis Hennepin, Nouvelle decouverte d'un tres grand pays situe dans l'Amerique, entre le nouveau Mexique et la mer glaciale. Utrecht, 1697; TPs of Kepler's Dioptrice . . . and Huygens's Traite de la Lumiere. . Illustrated Wraps. Very Good. 4to - over 9¾" - 12" tall. Toronto, 1967. 53 pp. including 16 b&w plates. 120 items. Light bumping to fore edge, inside fine. 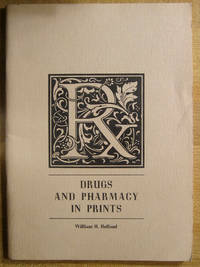 Contents: Introduction; Pharmacists and Apothecaries; Pharmacists Dispensing Medicines; Doctors Giving Medicine to Patients; John Bull and His Doctors; Patients Taking Medicines; The Taste of Medicines; Individual Subjects--Portraits; Individual Subjects--Caricatures; James Morison; Quacks and Quackery; Advertising; The Drug Store; Drug Store Interiors; Diseases and Illnesses; Death; Other Subjects. ''The group chosen for display in this exhibit includes caricatures, portraits, broadsides, and labels; there is even a card from a Victorian Peep Show. The prints include woodcuts, engravings and etchings, lithographs, and drawings. The people included range from the well-known (Napoleon, Gladstone, and Presidents Cleveland and McKinley) to the obscure; Many of the prints have some political significance while others comment on some of the social or professional problems of the day.'' Illustrated here are Der Apothecker: Engraving by Caspar Luyken, 1695; ¤ Tinct, Reform; Comp: Engraving by John Tenniel from Punch, 1887; ¤ Donnez-moi la premiere chose venue. Lithograph by J. J. Grandeville from La Caricature, 1832; ¤ Madame Bovary taking a jar of poison from the shelves of M. Homais' Pharmacy. Lithograph from Flaubert's Madame Bovary by Michael Cirry, c. 1955; ¤ James Graham (Emperor of Quacks) following a women. Engraving by John Kay, 1785; ¤ Mimi Veron croit avoir enfin trouve le veritable moyen de pulveriser son ennemi. Lithograph by Honore Daumier from Le Charivari, 1850; ¤ Esculape se mettant en garde pour defendre energiquement sa position. Lithograph by Honore Daumier from Le Charivari, 1859; ¤ Perry Davis' Vegetable Pain Killer. Engraved Label, 1854; ¤ Hostetter's Celebrated Stomach Bitters. Engraved advertisement, c. 1870; ¤ Apothecaries' Hall, Pilgrim St. Engraving by J. Hinchliff, 1831; ¤ Serenissimo Atq. Celsissimo Principi Ac Domino, Anonymous engraving, c. 1700; ¤ Death's Dispensary. Engraving by Dalziel from Fun, 1866; . Wraps. Very Good. 8vo - over 7¾" - 9¾" tall. Durham, North Carolina: Duke School of Medicine Library, 1956. 34 pp. 50 items. Bumping to top and bottom of spine, with short (less than 1/4-inch) spilits. Sewn wraps illustrated by a portrait of Thomas Gale from his Certain Workes of Chirurgerie, 1563 [No. 19]. 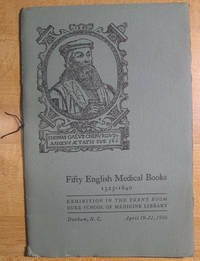 From the Josiah C. Trent collection in the history of medicine, an annotated catalogue of the exhibition. Compiled by Henry Schuman and Martha Alexander. . Wraps. Near Fine. 8vo - over 7¾" - 9¾" tall.